Gold Coast Australia cheap holiday accommodation on the Gold Coast is the Tourist capital of Australia with miles of surf beach, lush green rainforest, world-class golfing greens and world-famous theme parks. With every kind of accommodation from exclusive 5-star hotels to family beachside apartments. There's so much to see and do on your Gold Coast Holiday in areas like Broadbeach, Broadwater, Budds Beach, Burleigh Heads, Coolangatta, Currumbin, Kirra Beach, Main Beach, Mermaid Beach, Nobby Beach, Palm Beach, Rainbow Bay, Southport, Surfers Paradise, Tamborine Mountain, Tugun. 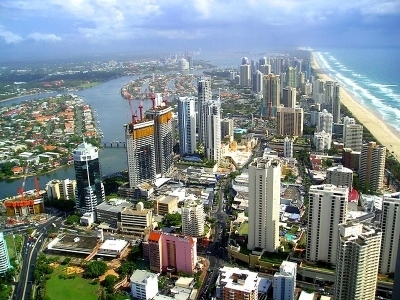 The Gold Coast is known for being an action-packed holiday destination. Whether it is the theme parks, attractions, tours or shopping all day long, there's something for everyone. The Gold Coast is also the home of Indy Car Racing, Magic Millions Horse Racing and Surf Lifesaving Championships, there's definitely lots happening. On the quieter side we also have our famous hinterland area only an hours drive away which includes world heritage listed national parks and reserves where visitors can enjoy wonderful views, local restaurants, picnic spots, shopping, bush walking, bird watching, swims in natural rock pools and 4WD day tours.